Background: Coffea canephora is the commonly cultivated coffee species in the world along with Coffea arabica. Different pests and pathogens affect the production and quality of the coffee. Jasmonic acid (JA) is a plant hormone which plays an important role in plants growth, development, and defense mechanisms, particularly against insect pests. The key enzymes involved in the production of JA are lipoxygenase, allene oxide synthase, allene oxide cyclase, and 12-oxo-phytodienoic reductase. There is no report on the genes involved in JA pathway in coffee plants. Objective: We made an attempt to identify and analyze the genes coding for these enzymes in C. canephora. Materials and Methods: First, protein sequences of jasmonate pathway genes from model plant Arabidopsis thaliana were identified in the National Center for Biotechnology Information (NCBI) database. These protein sequences were used to search the web-based database Coffee Genome Hub to identify homologous protein sequences in C. canephora genome using Basic Local Alignment Search Tool (BLAST). Results: Homologous protein sequences for key genes were identified in the C. canephora genome database. Protein sequences of the top matches were in turn used to search in NCBI database using BLAST tool to confirm the identity of the selected proteins and to identify closely related genes in species. The protein sequences from C. canephora database and the top matches in NCBI were aligned, and phylogenetic trees were constructed using MEGA6 software and identified the genetic distance of the respective genes. The study identified the four key genes of JA pathway in C. canephora, confirming the conserved nature of the pathway in coffee. The study expected to be useful to further explore the defense mechanisms of coffee plants. Conclusion: JA is a plant hormone that plays an important role in plant defense against insect pests. Genes coding for the 4 key enzymes involved in the production of JA viz., LOX, AOS, AOC, and OPR are identified in C. canephora (robusta coffee) by bioinformatic approaches confirming the conserved nature of the pathway in coffee. The findings are useful to understand the defense mechanisms of C. canephora and coffee breeding in the long run. Abbreviations used: C. canephora: Coffea canephora; C. arabica: Coffea arabica; JA: Jasmonic acid; CGH: Coffee Genome Hub; NCBI: National Centre for Biotechnology Information; BLAST: Basic Local Alignment Search Tool; A. thaliana: Arabidopsis thaliana; LOX: Lipoxygenase, AOS: Allene oxide synthase; AOC: Allene oxide cyclase; OPR: 12 oxo phytodienoic reductase. JA is a plant hormone that plays an important role in plant defense against insect pests. 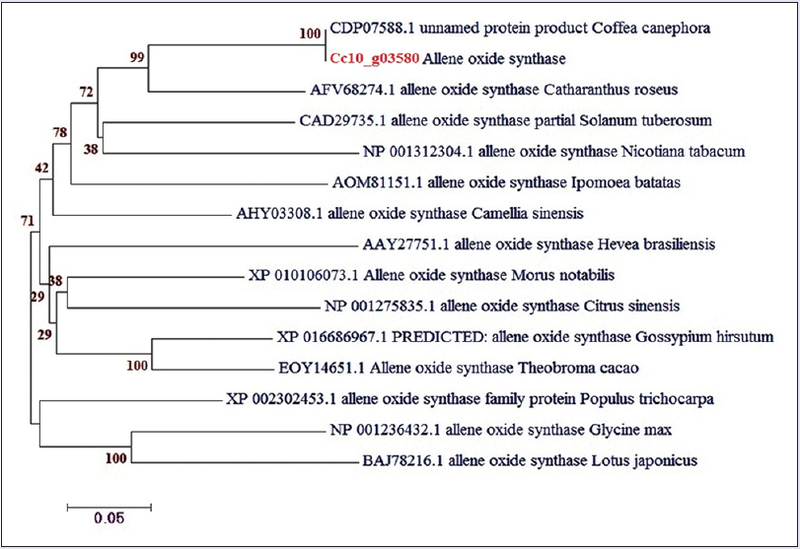 Genes coding for the 4 key enzymes involved in the production of JA viz., LOX, AOS, AOC and OPR were identified and analyzed in C. canephora (robusta coffee) by in silico approach. The study has confirmed the conserved nature of JA pathway in coffee; the findings are useful to further explore the defense mechanisms of coffee plants. 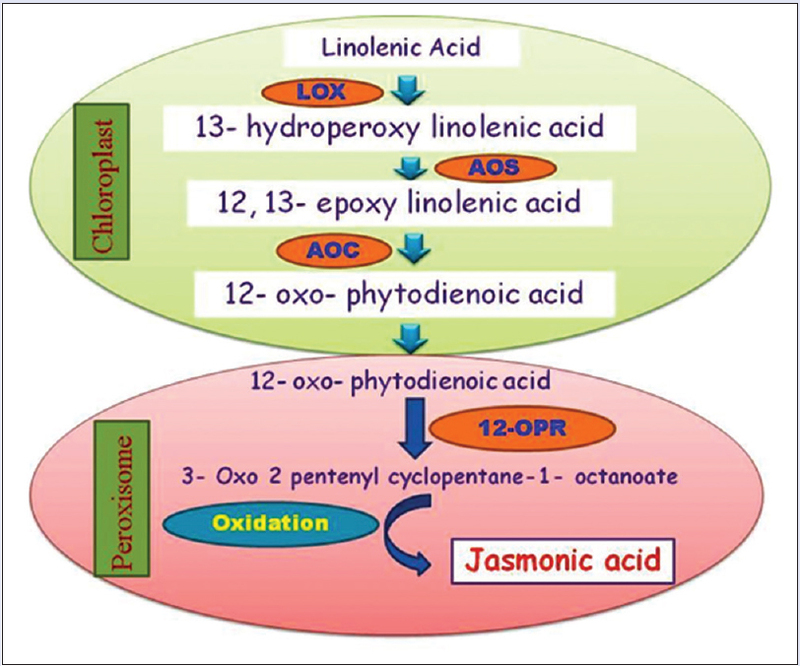 Jasmonic acid (JA) and its derivatives jasmonates (JAs) play a key role in plant metabolic processes and signaling systems when they are in stress and injured from pests.,,, JAs, also called as oxylipins, are derived from fatty acid α-linolenic acid through the formation of different intermediates, i.e., 13-hydroperoxy-9, 11, 15-octadecatrienoic acid by 13-lipoxygenase (LOX), 12-oxo-phytodienoic acid (OPDA) by allene oxide synthase (AOS) and allene oxide cyclase (AOC) in cytoplasm, and finally JA by OPDA reductase (OPR) through 3-oxo-2 (2'[Z]-pentenyl) cyclopentane-1-octanoic acid by β-oxidation in peroxisomes [Figure 1].,, The synthesis and signaling process of JA and JAs what we presently know is from studies on Arabidopsis thaliana and Solanum lycopersicum.,, Still, in many plant species including coffee, the jasmonate pathway is yet to be studied in detail. These plants have to be studied to know if they possess exactly the same biosynthetic pathway comprising similar enzymes that perform the same biological role in their metabolism as in Arabidopsis and Solanum. Coffee is one of the most important agricultural commodities; nearly 124 species are identified and exist around the world. However, only two species are considered commercially important, i.e., Coffea arabica L and Coffea canephora P, of which C. arabica is known for better cup quality compared to C. canephora. Between the two species, arabica is more sensitive to pathogens and pests (fungi, nematodes, and insects). In recent years, many coffee growers are shifting to robusta coffee cultivation due to high production costs, labor scarcity, and disease and pest management associated with arabica cultivation. The objective of the study was to identify key genes of JA biosynthesis pathway in C. canephora, which is one of the parents of the tetraploid arabica coffee along with Coffea eugenioides. Recently, C. canephora genome is sequenced producing a high-quality draft genome of the species. The complete genome sequences of C. canephora are available in the web-based database of Coffee Genome Hub ( http://coffee-genome.org/ ). The database served as a very useful resource in this study. GenBank Database of National Center for Biotechnology Information (NCBI; http://www.ncbi.nlm.nih.gov ) and database of Coffee Genome Hub ( http://coffee-genome.org/ ) were used to identify the presence of proteins of the key enzymes involved in JA synthesis. Molecular evolutionary genetic analysis software MEGA6 ( http://mega6.software.informer.com/ ) was used for sequence alignment and construction of phylogenetic trees. 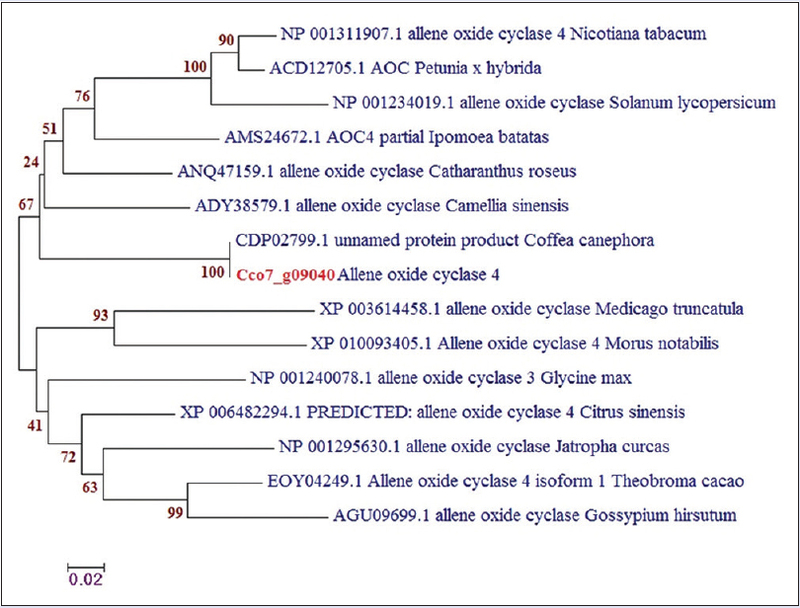 Protein sequence of different genes involved in the JA synthesis was taken from the model plant A. thaliana using NCBI database. Those sequences were used for Basic Local Alignment Search Tool (BLAST) search  and the Coffee Genome Hub database to identify the respective gene sequences in C. canephora. Among the matches in C. canephora, top match for each gene was taken and used for BLAST search against NCBI database. The top matches for C. canephora proteins involved in the JA pathway obtained in NCBI BLAST search were used for sequence alignment to obtain phylogeny trees using MEGA6 software. Around 14 top matches in NCBI database for each protein involved in the JA pathway and 1 top match from coffee genome database were taken from the BLAST results and transferred the sequence data to MEGA ALIGN tool in MEGA6 software. Using CLUSTALW alignment, the obtained sequences were aligned and by neighbor-joining method with bootstrap value 1000, the phylogenic trees were constructed. The main enzymes that play a key role in the biosynthesis of JA are LOX, AOS, AOC, and OPR  [Figure 1]. The enzyme LOX is involved in the production of the intermediate compound 13-HPOT by adding oxygen to α-linolenic acid at either C9 or C13 position, with 9S- or 13S-hydroperoxides.,, AOS and AOC are involved in the formation of 12-OPDA through unstable compound, an allene oxide. It is encoded by single gene in Arabidopsis,, two genes in tomato. OPR belongs to a small family of related flavin-dependent oxidoreductases forms the JA through β-oxidation in peroxisome.,,, The proteins of these enzymes were taken from model plant A. thaliana in NCBI database. 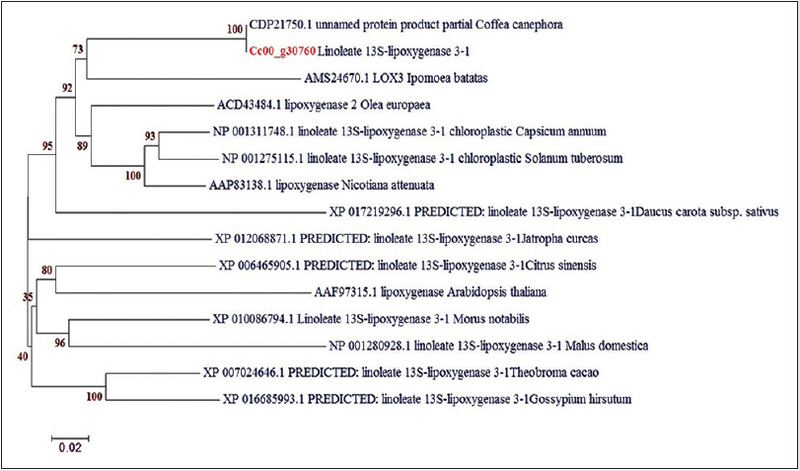 Selected protein sequences of A. thaliana were used to identify homologous protein sequences in C. canephora genome from Coffee Genome Hub database using BLAST tool. We identified the matching protein sequences related to LOX, AOS, AOC, and OPR enzymes with similarities ranging from 2 to 17 [Table 1]. 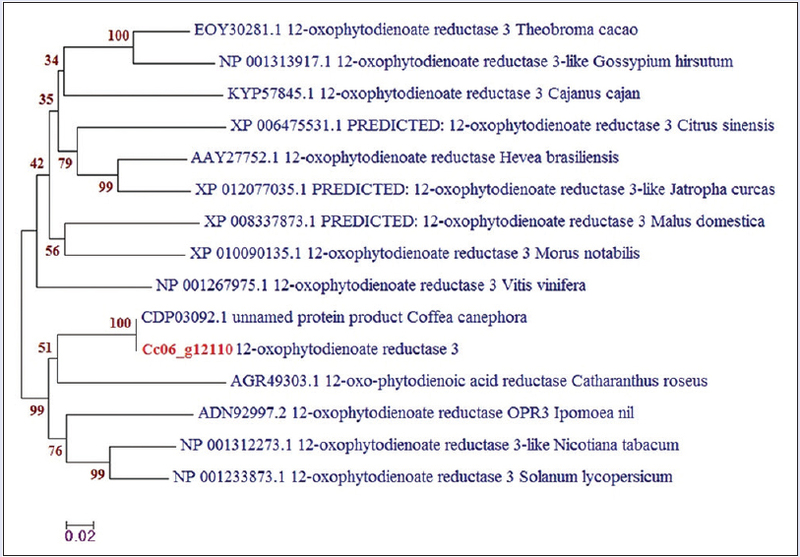 The same sequences were cross-checked again from coffee genome database with NCBI database and identified as unnamed protein products related to LOX, AOS, AOC, and OPR enzymes in C. canephora. The maximum number of similarities obtained in coffee genome database was 17 for OPR [Table 2], 7 for AOS [Table 3] and 11 for LOX [Table 4]. The minimum number of similarities obtained was 2 for AOC [Table 5]. Top one similarity for each enzyme was taken as main source to confirm with NCBI by doing BLAST. Matches in NCBI database for each gene were taken for phylogenetic tree construction. The evolutionary history was inferred using the neighbor-joining method. The percentage of replicate trees in which the associated taxa clustered together in the bootstrap test (1000 replicates) is shown next to the branches. The evolutionary distances were computed using the Poisson correction method  and are in the units of the number of amino acid substitutions per site. The analysis involved 15 amino acid sequences. Evolutionary analyses were conducted in MEGA6. LOX, AOS, AOC, and OPR trees mainly show two broad clusters. Each cluster is further divided into subclusters. The LOX tree mainly shows two broad clusters. Each cluster is further divided into subclusters. For LOX enzyme protein, one subcluster unnamed protein product from C. canephora and 13s-LOX (Cc00_g30760) from coffee genome was showing bootstrap value 100. In addition to this, Theobroma cacao and Gossypium hirsutum also showed bootstrap value 100 [Figure 2]. In AOS, one subcluster unnamed protein product from C. canephora and AOS (Cc10_g03580) from coffee genome was showing bootstrap value 100; in addition to this, T. cacao, G. hirsutum, Glycine max, and Lotus japonicus also showing bootstrap value 100 and Catharanthus roseus 99 [Figure 3]. In AOC, one subcluster unnamed protein product from C. canephora and AOC 4 (Cc07_g09040) from coffee genome was showing bootstrap value 100. Nicotiana tabacum and Petunia x hybrida were showing 90 and S. lycopersicum was showing bootstrap value 100. In addition to this, T. cacao and G. hirsutum are showing bootstrap value 99 [Figure 4]. OPR tree also mainly shows two broad clusters. Each cluster is further divided into subclusters. In subcluster I, unnamed protein product from C. canephora and 12-OPR (Cc06_g12110) which was taken from coffee genome was showing bootstrap value 100. In addition to this, T. cacao and G. hirsutum also showing bootstrap value 100; Nicotiana tabacum and S. lycopersicum showing bootstrap value 99 [Figure 5]. The present study confirms the presence of genes involved in the synthesis of JA pathway in C. canephora, and further studies are needed to know the complete mechanism of these genes during signal transduction in resistance from pests compared to other coffee species. 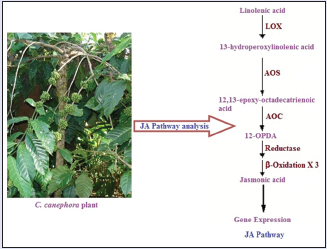 JA pathway is reported to have mainly LOX, AOS, AOC, and OPR enzymes occurs in chloroplast and peroxisome, but there was no report of the presence of these enzymes in coffee plants. From the above study, we are concluding that the JA synthesis enzymes present in the pest-resistant coffee plant C. canephora and identified the close relatives of each gene in the NCBI database related to coffee plant. This study will be useful to understand the resistance mechanism in C. canephora, and this study is helpful to increase the resistance in other coffee plants such as C. arabica by artificial JA application in their cultivation. The authors thank the authorities of Plant Biotechnology Division, Unit of Central Coffee Research Institute, Coffee Board, Mysore, for providing the necessary support. Farmer EE, Ryan CA. Octadecanoid precursors of jasmonic acid activate the synthesis of wound-inducible proteinase inhibitors. Plant Cell 1992;4:129-34. Creelman RA, Mullet JE. Biosynthesis and action of jasmonates in plants. Annu Rev Plant Physiol Plant Mol Biol 1997;48:355-81. Kramell R, Atzorn R, Schneider G, Miersch O, Bruckner C, Schmidt J, et al . Occurrence and identification of jasmonic acid and its amino-acid conjugates induced by osmotic-stress in barley leaf tissue. J Plant Growth Regul 1995;14:29-36. Browse J. Jasmonate passes muster: A receptor and targets for the defense hormone. Annu Rev Plant Biol 2009;60:183-205. Vick BA, Zimmerman DC. Biosynthesis of jasmonic acid by several plant species. Plant Physiol 1984;75:458-61. Rosahl S, Feussner I. Oxylipins. In: Murphy DJ, editor. Plant Lipids: Biology, Utilization and Manipulation. Oxford and Boca Raton: Blackwell Publishing Ltd./CRC Press; 2005. p. 329-54. Blechert S, Bockelmann C, Brummer O, Fusslein M, Gundlach H, Haider G, et al . Structural separation of biological activities of jasmonates and related compounds. J Chem Soc Perkin Trans 1997;23:3549-59. Narvaez-Vasquez J, Florin-Christensen J, Ryan CA. Positional specificity of a phospholipase A activity induced by wounding, systemin, and oligosaccharide elicitors in tomato leaves. Plant Cell 1999;11:2249-60. Turner JG, Ellis C, Devoto A. The jasmonate signal pathway. Plant Cell 2002;14 Suppl 1:S153-64. Davis AP, Maurin O, Chester M, Mvungu EF, Fay MF. Phylogenetic relationship in Coffea (Rubiaceae ) inferred from sequence data and morphology. Proc Int Sci Colloq Coffee 2006;21:868-75. De Castro, Renato D, Marraccini P. Cytology, biochemistry and molecular changes during coffee fruit development. Braz J Plant Physiol 2006;18:175-199. Denoeud F, Carretero-Paulet L, Dereeper A, Droc G, Guyot R, Pietrella M, et al. The coffee genome provides insight into the convergent evolution of caffeine biosynthesis. Science 2014;345:1181-4. Camacho C, Coulouris G, Avagyan V, Ma N, Papadopoulos J, Bealer K, et al. BLAST: Architecture and applications. BMC Bioinformatics 2009;10:421. Kumar S, Tamura K, Nei M. MEGA: Molecular evolutionary genetics analysis software for microcomputers. Comput Appl Biosci 1994;10:189-91. Higgins DG, Sharp PM. CLUSTAL: A package for performing multiple sequence alignment on a microcomputer. Gene 1988;73:237-44. Heitz T, Bergey DR, Ryan CA. A gene encoding a chloroplast-targeted lipoxygenase in tomato leaves is transiently induced by wounding, systemin, and methyl jasmonate. Plant Physiol 1997;114:1085-93. Feussner I, Wasternack C. The lipoxygenase pathway. Annu Rev Plant Biol 2002;53:275-97. Howe GA, Schilmiller AL. Oxylipin metabolism in response to stress. Curr Opin Plant Biol 2002;5:230-6. Song WC, Funk CD, Brash AR. Molecular cloning of an allene oxide synthase: A cytochrome P450 specialized for the metabolism of fatty acid hydroperoxides. Proc Natl Acad Sci U S A 1993;90:8519-23. Laudert D, Weiler EW. Allene oxide synthase: A major control point in Arabidopsis thaliana octadecanoid signalling. Plant J 1998;15:675-84. Sivasankar S, Sheldrick B, Rothstein SJ. Expression of allene oxide synthase determines defense gene activation in tomato. Plant Physiol 2000;122:1335-42. Ziegler J, Stenzel I, Hause B, Maucher H, Hamberg M, Grimm R, et al. Molecular cloning of allene oxide cyclase. The enzyme establishing the stereochemistry of octadecanoids and jasmonates. J Biol Chem 2000;275:19132-8. Delker C, Stenzel I, Hause B, Miersch O, Feussner I, Wasternack C. Jasmonate biosynthesis in Arabidopsis thaliana – Enzymes, products, regulation. Plant Biol (Stuttg) 2006;8:297-306. Liechti R, Farmer EE. Jasmonate biochemical pathway. Sci STKE 2006;322:1-3. Saitou N, Nei M. The neighbor-joining method: A new method for reconstructing phylogenetic trees. Mol Biol Evol 1987;4:406-25. Zuckerkandl E, Pauling L. Evolutionary divergence and convergence in proteins. In: Bryson V, Vogel HJ, editors. Evolving Genes and Proteins. New York: Academic Press; 1965. p. 97-166.